The answer is, Yes! Our MCAT prep books and online course are the best and most affordable prep available. Other exam prep companies overcharge customers, essentially making you pay for their “name”– and who wants to pay for that? If you could get the same quality or better for a fraction of the price, wouldn’t you? By using this book, I doubled my MCAT physcial sciences score from 5 to 10, with a 34 S overall. This book is very thorough, but not boring. It is very helpful, even if physics terrfies you. The comfortable writing style helps you get over your fears and allows you to learn a lot. I can’t recomend this book highly enough. The text is easy to read and understand, and the questions are the best out there for MCAT physics review. Buy this book early and give yourself time to work through it — you will end up feeling very comfortable in the physical sciences test. This book provides the most comprehensive review of physics available in prep books, and it provides numerous examples and MCAT style physics questions with thorough explanations. Even though its MCAT style questions are more difficult than the actual exam, it greatly prepares testakers for the challenges they face on the real exam. In my physics classes, I did not do particularly well in them, and this is the reason why I purchased the MCAT Physics Book. Before I used this book to study for the MCAT, my physical sciences section was a 9; but after preparing myself with this book, my score jumped to a 12 on the MCAT. I highly recomend this book for everyone. I’ve never taken a physics class in my life, and I smoked the physical sciences section. Everything (physics-related) on the test, except for two of the seventy-seven questions, was covered in this book. If you take the time to read a chapter a week and do the practice problems starting in January, you’ll be set for the MCAT in April. Best of luck! Absolute best in MCAT physics prep. It really put the Kaplan book to shame. ~50+ questions / chapter, half of which are near MCAT in style and difficulty. I trully believe that every last conceptual MCAT question is covered in this book. 10-15 page descriptions of each subject followed by several pages means you get it right even if physics is not your expertise. My experience in physics is only based on an accelerated summer course… so I definitely needed the help. The author is very clear and breaks down each subject into obvious/common sense approaches. The writing is very basic and easy to follow, but I definitely took guilty pleasure in the joke passages that were in every chapter. I guess Biehle has to have a sense of humor considering he got a doctorate in physics (the laughter hides the crying, I understand Biehle). If you read this book from cover to cover and do all the questions, there is no way you can get less than a 85% of the physics questions on your physical sciences. This is the best book by far in prep for the physics part of the physical sciences. By preparing with this book I got an 11 on the PS section. Its either this book or your huge physics textbook..you choose. It has 16 chapters and at the end of each there is set of 30 or 40 questions.The concepts are explained simply and it makes you wish your physics teacher had explained stuff to you in this way. This is a truely impressive review book – much, much better than the very boring Kaplan materials. I’m amazed that the author put so much effort into creating such an intuitive guide for us pre-meds. I highly recommend this book for anyone needing a review of physics for the MCAT and any undergraduates or high school students taking physics. It really goes beyond expectations for test prep!!!! If physics has always been a difficult subject for you, this is the book for you! This book helped me conquer the MCAT physics section. The book provides the most interesting analogies and gives true-to-the-real MCAT examples. Buy the book and get a serious edge over the competition. I used mcat chemistry book for the Aug. MCAT. It was great! I did well on the test and this book played a good role. The book is a good guide for mcat chem preparation for both general & organic. I can’t even tell you how many books I have purchased that claim they offer only info. relevant to the MCAT and nothing more…in which they wind up giving you all the superfluous stuff that *may* be on the MCAT. Well, this book is different. It cuts out all the extra mumbo jumbo and tells you like it is. Want to know about Glycolysis, fermentation, Kreb’s cycle and the ETC all in 2 hours memorized? Buy this book…it has a unique way of explaining things that other books, and professors, didn’t know how to do. I found myself relating difficult concepts together much easier in this book than any other. I think it’s great and it has boosted my confidence in the material for the MCAT. Get all three books for $77.95. A 40% discount. 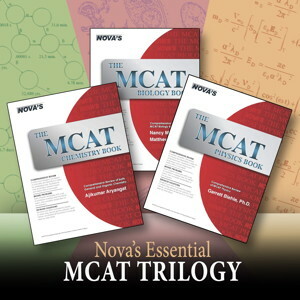 These three books together provide the most comprehensive MCAT prep available.